Listen to internet radio from Spotify, Grooveshark, SomaFM, Magnatune, Jamendo, SKY.fm, Digitally Imported, JAZZRADIO.com, Soundcloud, Icecast and Subsonic servers. Download missing album cover art from Last.fm and Amazon. Cross-platform - works on Windows, Mac OS X and Linux. Native desktop notifications on Linux (libnotify) and Mac OS X (Growl). Remote control using an Android device, a Wii Remote, MPRIS or the command-line. 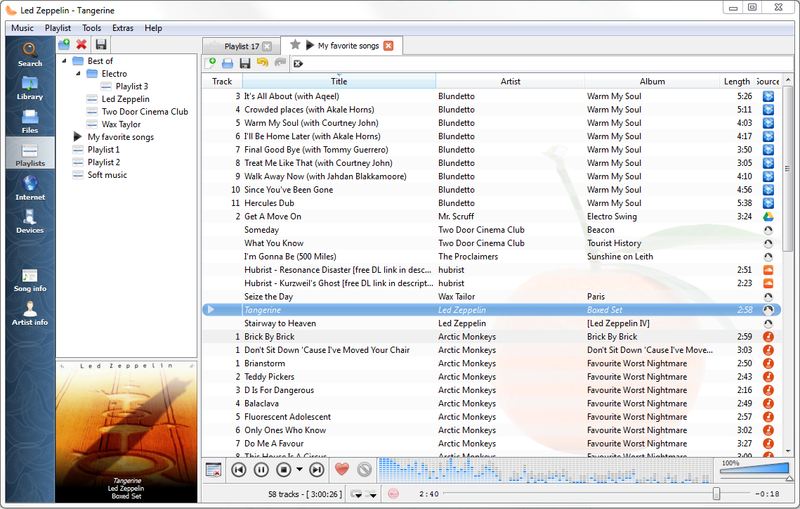 Clementine is a multiplatform music player. 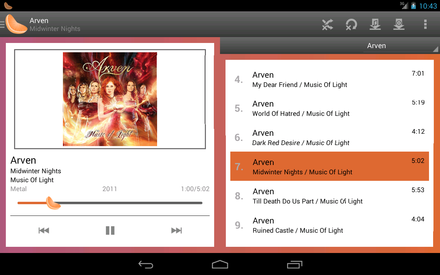 It is inspired by Amarok 1.4, focusing on a fast and easy-to-use interface for searching and playing your music. Fixes a bug where ratings are deleted when upgrading from older versions. This release adds Spotify, Grooveshark and SKY.fm/Digitally Imported support. We've also added a Global Search feature that allows you to easily find music that's either in your library or on the Internet. Other features include audio CD support, more transcoder options, an improved settings dialog, smarter album cover searches, and loads of bug fixes. See the full changelog for more information. In this release Clementine gains a brand new edit tag dialog with autocompletion and the ability to automatically identify music and fetch missing tags from MusicBrainz. CUE sheets are now supported - they are detected automatically when scanning your library and each track will show up separately. 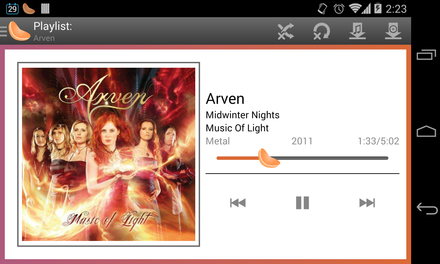 We've made a load of smaller improvements as well such as showing album covers in the Library tab, greying out deleted songs, a "Show in file browser" option, support for network proxies, a "Full library rescan" option, and a new tooltip for the track slider that helps you seek more accurately to a specific place in a song. See the full changelog for more information. This release features two new information panes that show lyrics, song statistics, artist biographies, photos and lists of tags and similar artists. We've redesigned the sidebar (although you can switch back by right clicking on it), and also added ratings, play counts and skip counts. You can create smart and dynamic playlists from songs in your library, and also now listen to music from Jamendo and Icecast radio stations. See the full changelog for more information. This release adds support for using portable devices with Clementine. You can now copy songs to your iPod, iPhone, MTP, or USB mass storage device. See the wiki for more information. Support for using a Wii Remote as a remote control has been added. Other features include a Queue Manager, an Organise Files dialog, automatically stretching columns in the playlist, loading embedded id3v2 cover art, more library scanning options, drag and drop between playlists, and a hypnotoad. We've also reduced startup time by more than half, fixed a load of memory leaks and reduced CPU usage while playing music. See the full changelog for more information. In this release we've switched to GStreamer on all platforms, meaning the analyzer and crossfading between tracks will now work on Windows. New features include an equalizer, more library grouping options, a nicer OSD, remote control from command-line and MPRIS, and easier tag editing. It's been just over a month since we released the first version of Clementine. This new version features album cover-art, better "Various Artists" detection, support for loading playlists, and much more. Clementine is Free Software under the GPL v3. This site is licensed under CC-BY-SA. Development by David Sansome, John Maguire and Arnaud Bienner. Website by Carlos Jenkins.